GENERAL INFO: All questions will be answered Monday-Friday between 8:30am - 5pm PST. If you cannot find the part you are looking for online please call us during business hours. 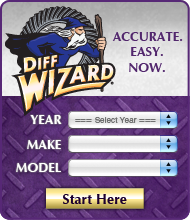 We carry a huge stock of good used differential parts that are not listed on our website. CANADA SHIPPING: All packages will be shipped out by the method selected in checkout unless otherwise specified. Standard delivery time within Canada is 1-7 business days depending on location. INTERNATIONAL SHIPPING: All packages are shipped out via Canada Post or UPS. For packages weighing less than 2KG(4.4lb) they will be sent via Canada Post Small Packet Air (8-15 business days) or Canada Post Small Packet Surface (4-8 weeks depending on location) This is the most cost effective option. All packages weighing over 2KG will be shipped by the method selected in checkout standard delivery time is 4-8 weeks depending on location. Some countries like Germany / Australia tend to hold packages in customs for up to 3 weeks. Express shipping options are available via Canada Post and UPS.